On this day eight years ago, the Philadelphia Flyers and Ottawa Senators set the NHL record with 419 combined penalty minutes in a single game. All but 22 minutes of that time came with under two minutes to play in the third period. Enforcers, Donald Brashear and Rob Ray got things started when the two squared off in the the Philadelphia zone. 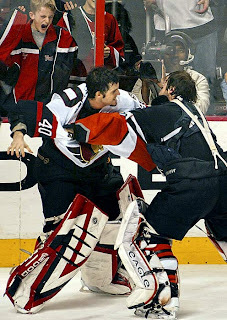 When the two were finished and on their way to the penalty box the rest of the players on the ice, including goalies, Robert Esche and Patrick Lalime, joined in and completed the line brawl. Over the course of the remaining moments of the game, fights involving, Chris Neil, Zdeno Chara, Michal Handzus, Mike Fisher, Patrick Sharp, and Jason Speeza brought fans to their feet. By the end of the game there was a total of 20 players ejected, and under four players remaining on each team's bench. A final tally credited the Flyers with 213 penalty minutes and the Senators with 206 penalty minutes. The Flyers won the game by a score of 5-3.